CREDIT & SOURCE: Labour Market Report published monthly by the Nova Scotia Department of Finance and Treasury Board. 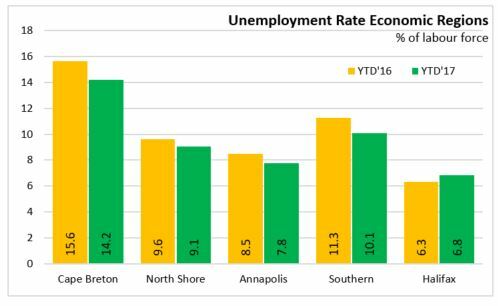 The Annapolis Valley unemployment rate has fallen to within one percentage point of the Halifax rate. Employment in the Valley increased by almost 5% in the January-September period of 2017 compared with the first nine months of 2016. CLICK HERE to read Valley highlights from the monthly Labour Market Report published by the Nova Scotia Department of Finance and Treasury Board.